Sick and tired of looking at that broken AC compressor or wanting to just drop some extra pounds from your car then check out UPR's AC Pump Eliminator Kit. Our kit maintains the factory belt length and works with all supercharged applications. Clean up your engine compartment and make it look good with our AC Eliminator Kit. 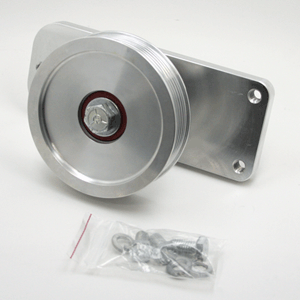 Machined from 6061 Billet Aluminum, Double sealed 6203 heavy duty bearing and all heavy duty hardware. 1986 1987 1988 1989 1990 1991 1992 1993 GT LX V8 302 Cobra Mustang Steeda Roush & Saleen Vehicles. No one else can stack up to the bold clean styling of our aftermarket Billet dress ups, Street Strip & Racing Suspension & Performance Parts for your late model American Muscle Car!